A wave of swimmers preps itself to take the plunge for the first leg of the 2016 Tri for a Cure. 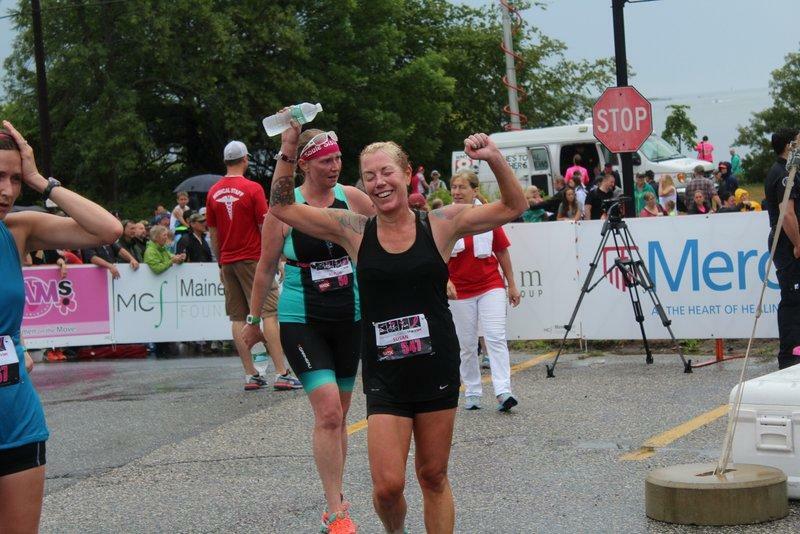 The Tri for a Cure proved so successful in its ninth running Sunday, July 17, that it pushed its all-time funds-raised past $10 million. 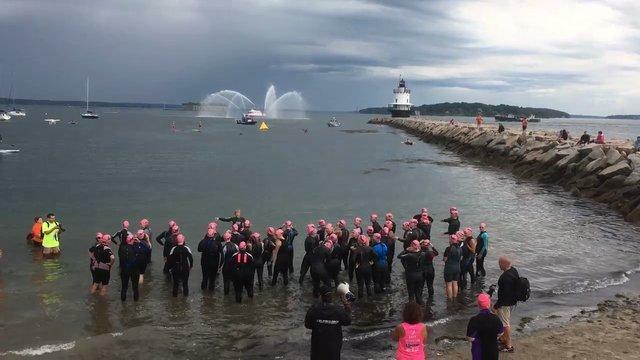 The triathlon, held at Southern Maine Community College in South Portland, has become a Maine institution, attracting more than 1,000 participants and thousands more spectators. “Last year, we had nine ladies who raised over $5,000,” said McGough. “This year, at a minimum, we had 17.” This year’s No. 1 fundraiser was Linda Banks of Falmouth, who raised $21,000. 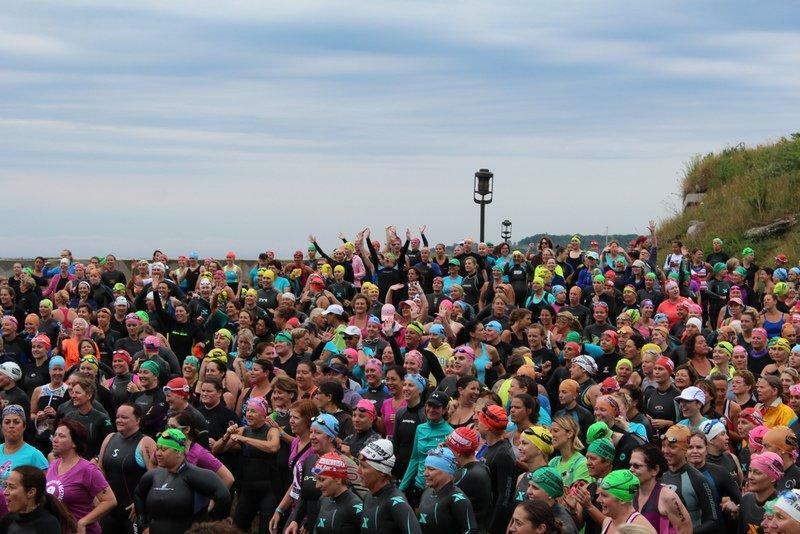 Participation in this year’s Tri maxed out months ago; approximately 1,400 women took part. 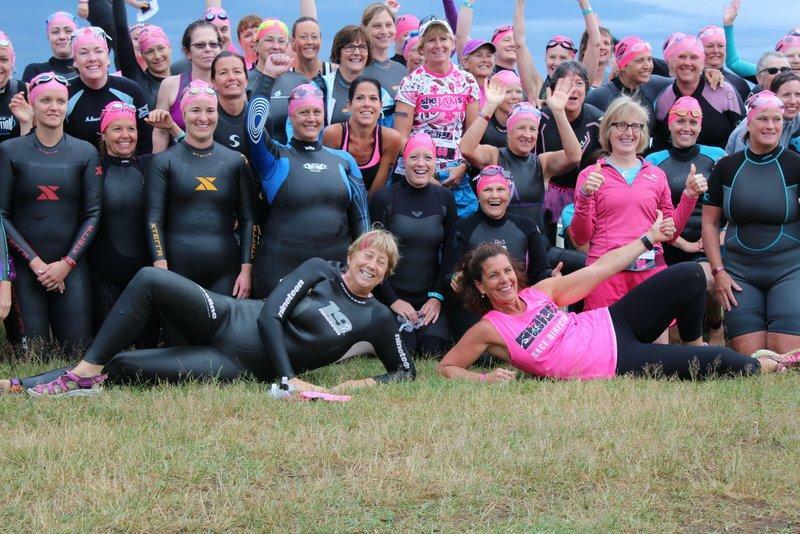 Roughly 10,000 women have now taken part in the Tri since its inception. Carly Traub, 29, of York Beach won the Tri, taking victory in 1:17.58.3. Renee Lang Durgin, 43, of Scarborough finished second (1:19:10.4) and Heather Geoghan, 36, of Falmouth took third (1:21:10.6). Two more Scarboroughites, Faye Maier and Lisa Chaisson, took fourth and fifth, respectively, and Laura Getchell, 25, of Raymond, took sixth. Further back in the standings were proud names like Anne Lapierre, 42, of Gorham in 19th; Allison Barrett, 36, and and Emily Wesolowski, 35, both of Freeport, in 32nd and 35th, respectively; and more. A couple of heavy downpours Sunday were taken in stride, both by participants and volunteers. “It didn’t stop a single person. Half of me expected the crowd to run for their cars, but everyone stayed right where they were,” McGough said. “Rain is tough on volunteers – we have over 400 of them. Rain makes it dangerous on the bike, too. Slippery conditions,” said race founder Julie Marchese. McGough highlighted another imporant annual Tri event: the Survivor’s Breakfast, held Saturday. “I was in there, listening to everybody speak, and Julie said, ‘You know, we never thought, nine years ago when we started the race, it would get this big. It was just a couple hundred people doing a small race. And every year, we do the Survivor’s Breakfast, and there are more and more survivors. That used to bother me, more and more people coming in who’ve had cancer. Then I realized, there’s more people who are living through cancer. They’re surviving,'” McGough said. The Tri for a Cure attracts some 1,400 participants each year – and thousands more spectators. The Tri’s top earners reveal the total funds raised this time around. Race founder Julie Marchese, front right, and her cohort in leading the event, Meredith Strang-Burgess, front left, pose with a dedicated crowd of triathletes. South Portlander Susan Robbins, 49, finished 46th overall and fifth in her age bracket, needing a combined time of 1:31:48.9 to do so.